The Sweetwater Range, on the very eastern border of California, is a solitude seeker's dream. There was something powerfully nostalgic about traveling to the Sierras for the first time in nearly 7 years. Coming up over Sonora Pass was like seeing an old friend. I guess it was a bit odd that I just kept going past and landed in the Sweetwater Range. I thought I was a bit crazy to pass up such a familiar place but for some reason I was feeling like being in the desert that weekend. 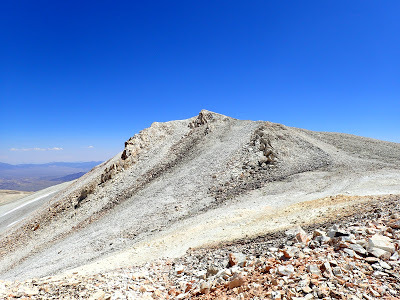 The eastern Sierras and the various mountain ranges on the California-Nevada border go largely underappreciated for residents and travelers of California. 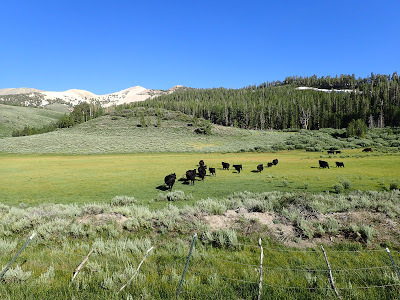 I find this a bit odd as the attractions of the area are phenomenal- Mono Lake, the Ancient Bristlecone Pine Forest and the White Mountains are stand alone destinations. However, it is a little counter-intuitive to be passing up the likes of Yosemite, Sequoia and Kings Canyon National Parks to get there. However, if solitude, sweeping views and uninterrupted wilderness are things you appreciate, you will have no trouble leaving those familiar places for something new. I was feeling a little daring now that I have a true 4 wheel drive vehicle with comparatively high clearance to my old sedan. 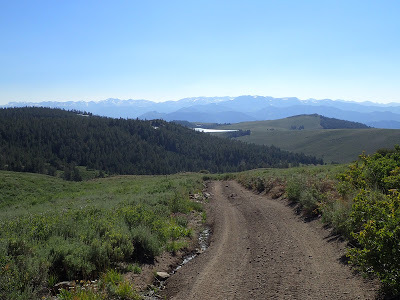 There are parts of the Sweetwater Range that are strictly accessible to serious 4-wheel drive vehicles but you can get to most trailheads by good 2-wheel drive vehicles. Having said that, I don't think I would have driven up this way in my old sedan! As you can see from the map above, there isn't a shortage of free drive-in campsites with fantastic views of the Sierras. I ran into a few 4x4 folks who were very courteous and willing to share their more extensive knowledge to help orient me to the area. The trailhead I used was right on the shore of Lobdell lake (which is a reservoir). There's some fishing and campsites at the lake. Although its not natural, it is a fairly peaceful place to camp or begin hiking! Things can be a bit confusing here. The 4x4 road circles around the west shore of the small lake and it is possible to shave off about a mile of walking to drive to the second trailhead (which actually has a sign). I was told this would be a bit dicey in my car, so I parked near the southern shore. Note, there is no formal trailhead here and I essentially followed closely along the eastern shore of the lake, crossed the small creek feeding into it and walked up the 4x4 trail to the first major fork in the road. From here, there is a sign letting you know you're about to travel into an alpine wilderness and to leave no trace. This is the only sign with a map and directions I spotted on the trip. Directions are fairly straightforward but just be aware of this. From a hiker's perspective, the road/trail is in excellent shape. I ran into a crew of 4-wheel drivers doing some train maintenance to keep it that way; God bless them! I ran into about a dozen folks that day in various 4-wheel drive vehicles and all of them were very pleasant to me. I found them to be some of the kindest people I've ever met on a wilderness hike! 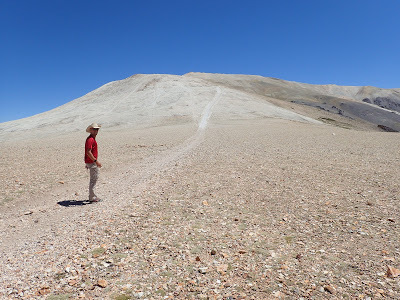 The road steadily ascends the mountain with very little elevation loss or flat sections. Water sources are fairly numerous and dependable up until about 10,000 ft. I didn't have any problems crossing the East Fork of Desert Creek although earlier in the summer this could be a bit rough. As the trail rises above treeline, the brilliant volcanic colors of the mountains become more evident. 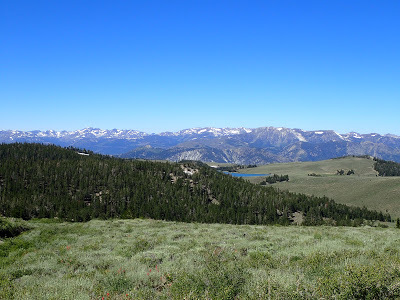 This part of Eastern California has no shortage of volcanic features which are most obvious near Mammoth Lake and in the Devils Postpile National Monument. The Sweetwater Mountains themselves are the obvious remnant of the explosive Little Walker Caldera. 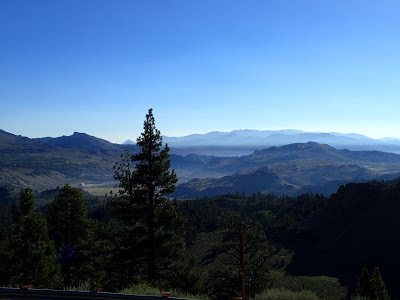 It's ancient rim is not as obvious as that of more southerly calderas in Mono County but the view from the Sweetwater Range is illuminating. Thankfully the area is long extinct from its more violent geological past leaving behind mountains of orange, violet and red ribbons. Surely these are some of the most colorful mountains in the state! 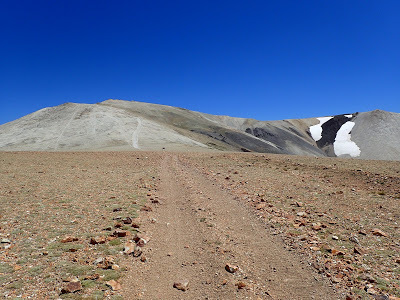 At about 11,100 ft, the trail comes crests on a fairly level plateau that looks like Mars. Devoid of the lush vegetation below, only scrubby, flowering plants seem to flourish this desolate environment. They are easily mistaken for rocks but the environment is sensitive to trampling and off-road driving. 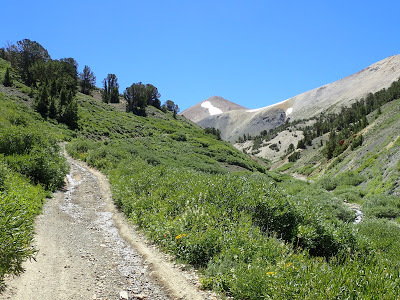 Hikers and drivers should not veer off trail. 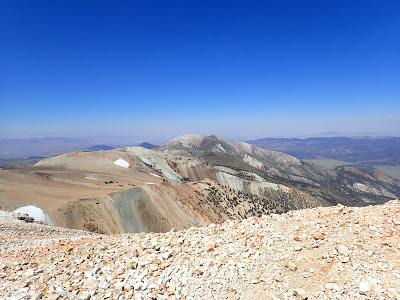 At the summit, I was greeted with fantastic views of Nevada and California. Snow lingered even into August after a very snowy winter. 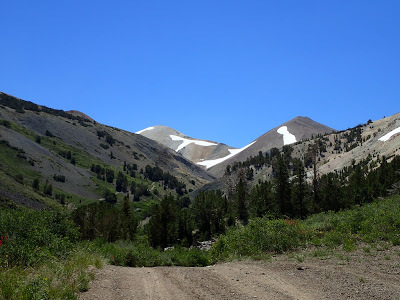 I was told that the road did not clear of snow until late July this year! I lucked out. Its the same way down but the late afternoon light continued to create an ethereal sight that made if feel like I was on a different route. Mt Patterson is the highest mountain of the range but hardly the only place to see. 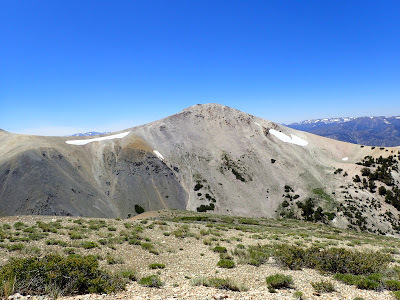 Wheeler Peak looks like it is worth the trek as well. The sisters- South, Middle and Eastern are an off-trail trek that is rarely done but I'm sure it is quite the adventure as well. Even though I was a bit sad to not have spent more time in the Sierras, I was so happy to have stumbled upon this gem!